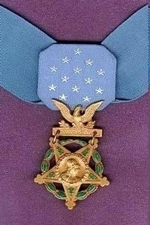 Citation: For conspicuous gallantry and intrepidity at the risk of his life above and beyond the call of duty: Specialist Ty M. Carter distinguished himself by acts of gallantry and intrepidity at the risk of his life above and beyond the call of duty while serving as a Scout with Bravo Troop, 3d Squadron, 61st Cavalry Regiment, 4th Brigade Combat Team, 4th Infantry Division, during combat operations against an armed enemy in Kamdesh District, Nuristan Province, Afghanistan on October 3, 2009. On that morning, Specialist Carter and his comrades awakened to an attack of an estimated 300 enemy fighters occupying the high ground on all four sides of Combat Outpost Keating, employing concentrated fire from recoilless rifles, rocket propelled grenades, anti-aircraft machine guns, mortars and small arms fire. Specialist Carter reinforced a forward battle position, ran twice through a 100 meter gauntlet of enemy fire to resupply ammunition and voluntarily remained there to defend the isolated position. Armed with only an M4 carbine rifle, Specialist Carter placed accurate, deadly fire on the enemy, beating back the assault force and preventing the position from being overrun, over the course of several hours. 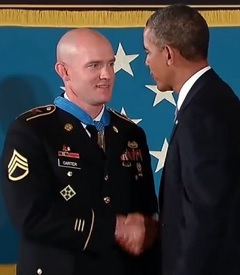 With complete disregard for his own safety and in spite of his own wounds, he ran through a hail of enemy rocket propelled grenade and machine gun fire to rescue a critically wounded comrade who had been pinned down in an exposed position. Specialist Carter rendered life extending first aid and carried the Soldier to cover. On his own initiative, Specialist Carter again maneuvered through enemy fire to check on a fallen Soldier and recovered the squad’s radio, which allowed them to coordinate their evacuation with fellow Soldiers. With teammates providing covering fire, Specialist Carter assisted in moving the wounded Soldier 100 meters through withering enemy fire to the aid station and before returning to the fight. Specialist Carter’s heroic actions and tactical skill were critical to the defense of Combat Outpost Keating, preventing the enemy from capturing the position and saving the lives of his fellow Soldiers. Specialist Ty M. Carter’s extraordinary heroism and selflessness above and beyond the call of duty are in keeping with the highest traditions of military service and reflect great credit upon himself, Bravo Troop, 3d Squadron, 61st Cavalry Regiment, 4th Brigade Combat Team, 4th Infantry Division and the United States Army.